Many people usually blames bad motherboard if they experience problems with their computer. But how do you make certain it’s a motherboard issue and not any other component? The thing is, there are other issues caused by a specific component that may be misconstrued as a motherboard failure. To avoid misdiagnosing a problem, make sure that you read through this brief material. Motherboard failure is one of the most challenging issues any user or technician can face simply because there are a number of variables to consider. To get down to the bottom of the issue, a technician will usually have to eliminate several software and hardware causes. Usually, there are not many signs to come by to help you diagnose a motherboard failure. A motherboard either works or not, nothing in between. Other peripherals like fans and hard drives may still work even if the motherboard is dead but your computer may still not work at all. If you think motherboard is to blame, make sure that you consider the items below. Physically damaged parts. The first thing that you want to do, especially if you haven’t opened a computer yet, is to physically check the motherboard. This will allow you to examine if there is any bloated or damaged capacitor causing the issue like the ones identified in the figure below. Leaking or bloated capacitors are usually products of overheating, material defect, or plain old aging. 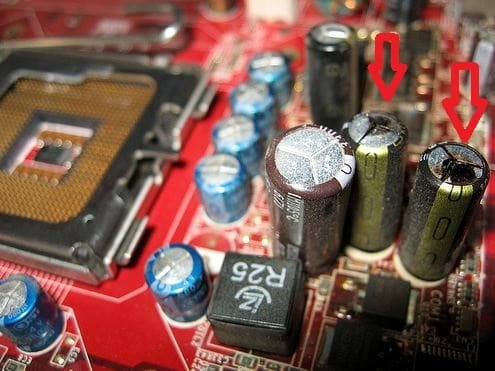 If you can see a capacitor that’s about to blow, you can assume that the reason for your motherboard problem. Look out for unusual burning odor. Another telltale sign of a motherboard problem is burning smell. Most of the time, a really strong burning smell is an indication that an overheated component. Sometimes, plugging in an incompatible component can lead to overheating or failure so if you’ve installed any component prior to noticing the problem, make sure to remove it right away. You cannot just install a component to any motherboard so make sure that you consider checking compatibility first. Plugging in an incompatible RAM or video card for example may lead to severe problems so as to damage the motherboard permanently. Random lock ups or freezing issues. If you’ve noticed that your computer has been freezing up lately, the first thing that you should do to troubleshoot it is to see if software is to blame. However, if you’ve already ruled out all software factors, the next good thing to do is to consider other hardware variables, including the possibility that the motherboard may be failing. Blue screen of death. Getting a blue screen of death on your computer does not automatically means a motherboard issue. At lot of times, the main reason may be a bad driver or hardware failure. If you can, take note of the error message, especially the error code which looks like this one (0x000000(0x000000,0x000000,0x000000,0x000000). Once you have the code, use Google to research it to see if it says something about motherboard failure. Some peripherals appear to stop working for a few seconds. Computer taking a long time to boot up. Motherboard does not do POST or Power On Self Test. Fan failure. Dust can accumulate very fast in fans causing them to fail. Make sure that you clean the fans inside the tower at least once every year. Too much dust in the system. Dust, like heat, can shorten component lifespan and the motherboard in general. Try your best to clean the inside of your computer regularly. Accidental drop that subjects components to unnecessary shock. Power surges or unstable voltage. There are usually two troubleshooting categories that a user or a technician can follow in order to troubleshoot a bad motherboard. The first one checks if the computer does POST and still boots, while the second checks if the system fails to do POST or no longer powers back on. POST is basically a diagnostic test run by your motherboard’s BIOS to check if peripherals like hard drives, video card, RAM, keyboard, or mouse are all connected or not. If the essential peripherals are detected, BIOS then loads the operating system. If the computer can load the operating system after POST, motherboard failure may not necessarily be the main reason for your problem. You need to rule out other potential hardware reasons first in order to determine if the motherboard is bad or not. To troubleshoot your hard drive, kindly follow our guide in this page. Check the PSU (Power Supply Unit). Often the most underrated or even neglected component, the PSU is just as important as the motherboard itself. And yet a lot of users don’t usually pay much attention to it, even when their computer dies. Basically, a PSU provides power to your computer and if it doesn’t do its job well, or if it’s out of specification, if may lead to permanent system damage. If the load is too much for the PSU, the resulting insufficient power supply to the system can also result to severe damage to other components. It is therefore a must that you use a good power supply. Consult your motherboard manual on how to check the voltage of the PSU using BIOS menu. There are also software utilities provided by motherboard manufacturers that can do the job. Check the Central Processing Unit (CPU). As the heart of any computer system, a processor failure often results to an unstable system or total failure. Thus, it is relatively easy to recognize a CPU issue because the entire system either works when it does, or doesn’t turn on or becomes unstable if it doesn’t. 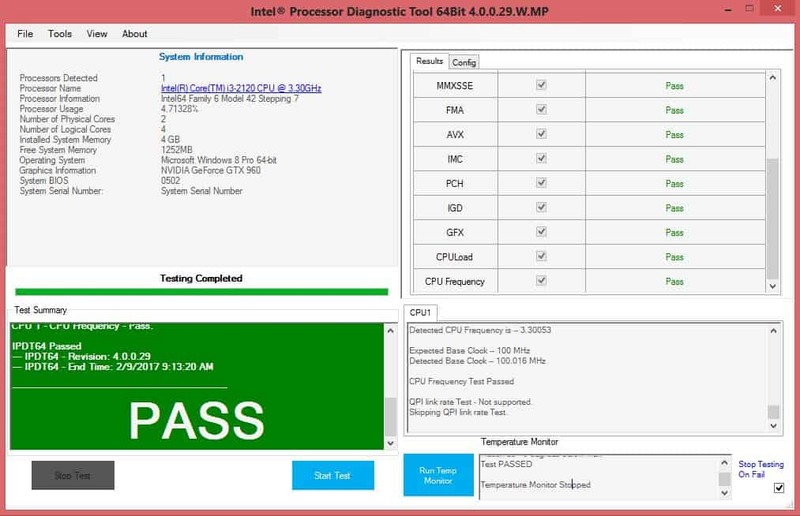 if you have an Intel processor, we recommend that you use their Intel Processor Diagnostic Tool to check the status of your CPU. Check the Random Access Memory (RAM). Installing an out of spec RAM can cause instability problems, which can sometimes be misinterpreted as a motherboard issue as well. Unreliable RAM can lead to a lot of problems such as infrequent crashes, corrupted data, freezing issues, etc. If the problem occurred after you added a RAM chip, try to remove it from the system and reboot it. You can also do a software check on your existing RAM by using free software such as Memtest86 or Memtest86+. Check the Graphics processing unit (GPU). If you’ve seeing unnatural pixilation on the screen, or if artifacts appear from time to time, it’s very likely that you have video problem. All motherboards have built-in video capability but they are often not enough to play graphics intensive tasks. Gamers usually add more powerful GPU to their computer to circumvent this limitation. If you installed one in your system, it’s possible that the video card may be to blame. Consider removing it from the motherboard to see how the system works without it. Check if BIOS firmware is updated. Sometimes, updating the current BIOS version can fix motherboard ills. Consider checking your motherboard documentation to see how to update the BIOS. Do a visual hardware check. If you run a more sophisticated rig that has lots of extra hardware peripherals on it, make sure that you check all the connections. Sometimes, reseating the connections can do wonders so simply go through each connected peripheral before attempting another reboot. Make sure that all fans are working to ensure that the there’s sufficient cooling and ventilation. This second category assumes that nothing happens at all when you press the power button on. In most cases, the cause is more likely hardware in nature so there are important things that you must do to check. Check the motherboard physically. As mentioned above, you want to ensure that everything is connected properly and that there are no leaking capacitors. Depending on your motherboard type, an LED light may help indicate if a critical component like RAM, hard drive or CPU is working. If everything appears to be working normally and there’s no visible damage to all components, the motherboard is most probably okay and there’s another reason why your computer does not work turn on at all. If you have another known working PSU, try using it in your system to see if the current PSU is simply dead, or malfunctioning. Sometimes, having too many installed peripherals can overload the system so try disconnecting non-essential components like the optical drive or the video card to see if the computer will work normally. Check the Complementary Metal-Oxide Semiconductor or CMOS. CMOS is an on-board chip that stores information, usually BIOS settings a computer needs like date and time, system’s boot sequence, among other else. CMOS is powered by a battery that can run out of juice after some time. This Lithium-ion battery helps CMOS store the volatile information BIOS uses when your computer loads. If this battery dies, your BIOS settings will revert back to their defaults once the computer restarts. If you noticed that your computer’s clock has changed without your knowledge, that may be an indication that the CMOS battery may have died. Make sure to consult your motherboard’s documentation if you want to check CMOS. Consult a professional. 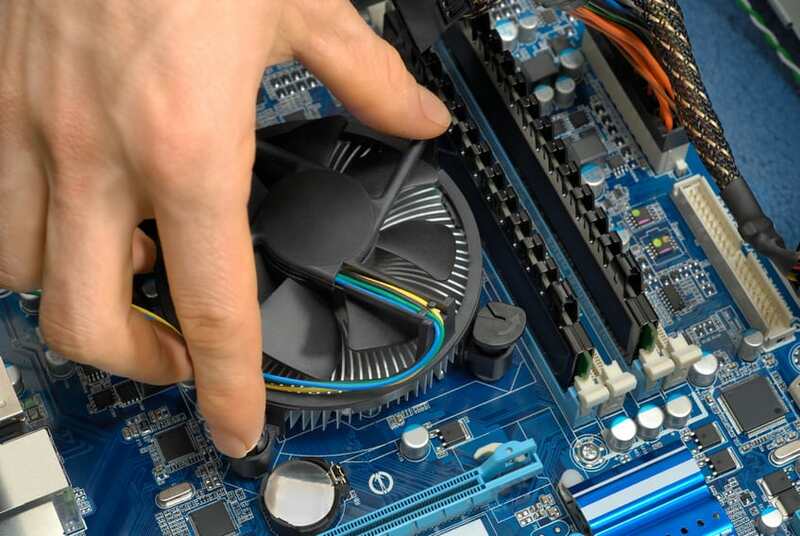 If you’ve already ruled out everything and it appears that motherboard failure is the main reason due to one of the reasons above, we suggest that you allow a professional do the job for you. Try to avoid a motherboard repair, especially if you don’t have a solid knowledge about electronics. You may be able to identify a leaking capacitor but you will have to have a certain level of expertise and knowledge as well as the right set of tools to fix or replace it. Of course you can simply have the motherboard replaced but you also have to consider that the replacement one is exactly the same one. Not doing so will risk making other components like the old processor, RAM, or even the PSU incompatible with the new motherboard. Again, if you’re not sure, try to consult a professional if you aren’t sure of what’s you’re doing. Good article. The section I really want to see in here is “What to do if POST is successful but computer does not load the operating system”. As in, I can get into the BIOS fine, make changes, save them, but when I try to install Windows, the motherboard restart just before loading the first Windows setup screen. I can see the splash screen with the rolling dots, but as soon as it goes and change the graphic resolution, bang, power off and power back on, but then, it never comes back on. Have to turn power switch on PSU off for 15 seconds, and I can get back into the BIOS fine. I tried 2 known good PSU, I tried 2 known good CPU (a 2nd gen and a 3rd gen iCore known to be compatible with chipset and socket), using on-board graphics. When I try all of this with a dedicated graphics card, I get a similar issue but sometimes it doesn’t boot into BIOS at all. Fine if I remove video card, and have tried more than one. At this point, would this be a capacitor issue on the board? I don’t know enough electricity to troubleshoot this part but my gut feeling tells me it’s a power issue, just not sure which part of the board it would be.